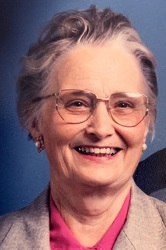 Mrs. Mary Yvonne Green Gunn, age 90, of Forest, Mississippi, departed this life Monday, April 8, 2019, at her beloved earthly home and transitioned to the heavenly home for which she longed. Funeral services will be conducted at 3:00 pm on Thursday, April 11, 2019, at the Ott and Lee Funeral Home Chapel in Forest, with Rev. David Goree officiating. Interment will follow in the Ridge Baptist Church Cemetery. Visitation will be held on Thursday from 1:00 pm until 3:00 pm at the funeral home prior to the service. Born Mary Yvonne Green on January 17, 1929, in Leake County, Mississippi, Yvonne graduated from Walnut Grove High School in 1947. She married the love of her life, Penson Gunn, Jr. in June of that same year. Her greatest joys in life were being a wife to Penson, a mother to Janie and Mark, and a grandmother to Chris. She was a faithful member of Ridge Baptist Church, serving both her church and community in countless ways. Yvonne directed Vacation Bible Schools for many years and volunteered with the Helping Hands ministry. She also loved to play the piano and had the privilege of teaching numerous students in her home and at South Leake Elementary School. Both an accomplished seamstress and cook, she delighted in sharing these talents with her family, friends and neighbors. In later years, favorite pastimes were reading, watching birds, and enjoying her flowers. A prayer warrior and a woman who diligently studied and lived by the word of God, Yvonne loved the Lord and her first priority was serving Him. Though she will be greatly missed by all who knew and loved her, we rejoice that she is now in the presence of her Savior, Jesus Christ. Mrs. Gunn is survived by her son, Mark Gunn and his wife, Sherry, of Meridian, Mississippi; son-in-law, Erbert Gomillion, Jr. of Jackson, Mississippi; grandson, Christopher Gomillion and his wife, Jaci, of Ridgeland, Mississippi; sister, Grace Green Roberts of Baton Rouge, Louisiana; brother, Edward Green of Lena, Mississippi; nine nieces; four nephews; and special caregivers Barbara Shoemaker and Helen Stewart. She was preceded in death by her loving husband of 65 years, Penson E. Gunn, Jr.; her daughter, Janie Faith Gunn Gomillion; her parents, J. B. and Nina Jones Green; sister, Laura Green Clark; and brothers, Colon Green, Nolen Green and Malcolm Green. Serving as pallbearers are David Hankins, Tommy Jones, Johnny Ladd, Frank Perry, A. C. Swanson, and Greg Winstead. Honorary pallbearer is Stanley Puckett. The family requests that any memorials be made to the Ridge Baptist Church Cemetery Fund or a favorite charity.